In Hollywood, just about everyone (and everything) gets their five minutes of fame, including the lowly office cubicle. 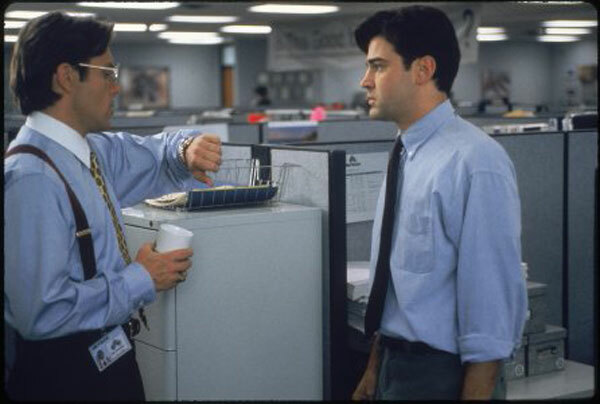 Sure they might not get any lines, but cubicles have starred in the background of plenty of modern movie classics while reminding us to file those TPS reports, grab another cup of coffee and fight the man. 1. “Office Space” – Any list of movies featuring famous office cubicles (or really anything at all about office life) has to be topped by this classic about the disenchanted cube dwellers at Initech who plot to steal from the company that has sucked the life force out of them. Our favorite movie moments: Lumbergh’s “that’d be greaaaaaat,” the office printer beat down and, of course, Milton’s red Swingline stapler. 2. “Fight Club” – Edward Norton plays a desk jockey with insomnia who joins forces with a mysterious soap maker to form an underground fight club that quickly spins out of control. That latte-covered made history, but we hope most people don’t show up to work with bloodstains on their shirt. 3. 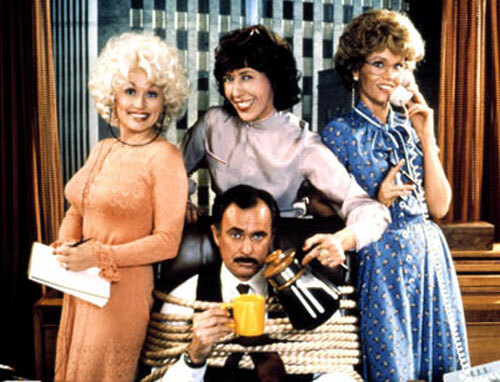 “9 to 5” – Toss one misogynistic, egotistical, hypocritical, lying boss and three sassy, revenge-seeking and big-haired assistants (Jane Fonda, Lily Tomlin and Dolly Parton) in an office and hilarity ensues (especially once the aforementioned assistants trap their awful boss in his office and take the reins). 4. 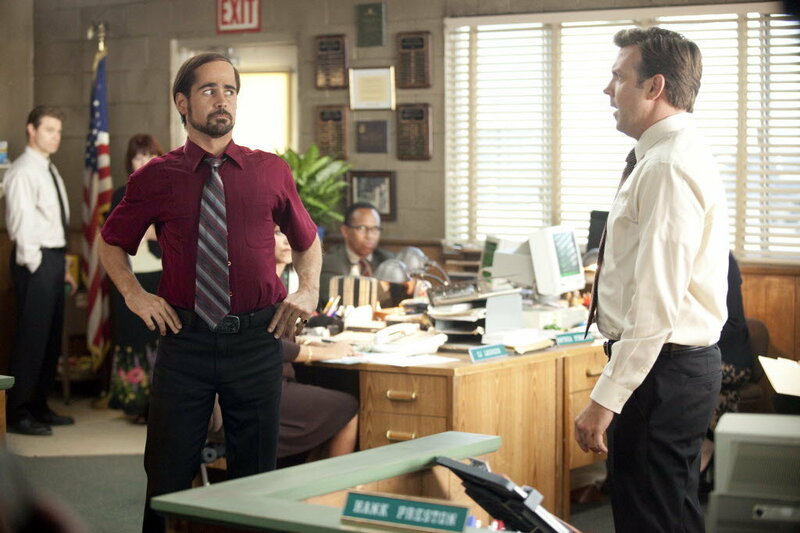 “Horrible Bosses” – Why is it that so many movies about office life feature the world’s most detestable bosses? Is the average U.S. office space so tragically mismanaged? Here’s another entry in the stick-it-to-the-man category. In “Horrible Bosses” Jason Bateman, Charlie Day and Jason Sudeikis plot to kill their slave-driving, sexually harassing and incompetent overlords played to cringe-inducing laughs by Jennifer Aniston, Kevin Spacey and Colin Farrell. 5. “Working Girl” – Plucky secretary (Melanie Griffith) swaps roles with her repugnant boss (Sigourney Weaver) in order to steal back an idea that was rightfully hers, climb the corporate ladder and conveniently fall into the ever-charming arms of Harrison Ford. Watch out for shoulder pads, hair so huge it needs its own area code and desktop computers that are probably in museums by now. 6. 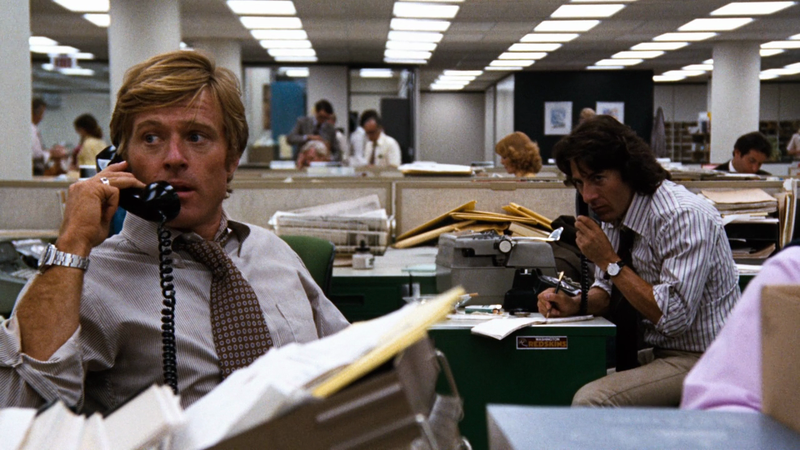 “All the Presidents Men” – Intrepid Washington Post reporters Bob Woodward and Carl Bernstein (Robert Redford and Dustin Hoffman) dig deep (throat) to uncover the Watergate scandal that led to President Nixon’s resignation. We’re sure the fluorescent-lit open plan newsroom will look familiar to those working in more collaborative offices these days (minus the typewriters, of course). 7. 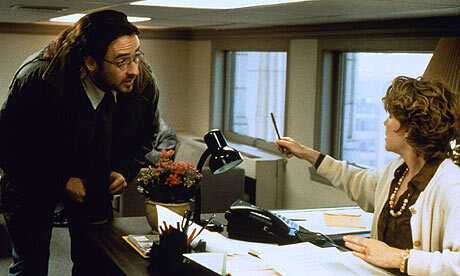 “Being John Malkovich” – Perhaps the oddest flick on our list, in “Being John Malkovich” John Cusack stars as a puppeteer who stumbles upon a portal behind a filing cabinet in the offices of LesterCorp that leads into the head of movie star John Malkovich. Did we mention that the offices of LesterCorp are located on the 7 1/2-floor of a Manhattan office building and that the ceilings are only five feet tall? Your office job might make you feel like you have the weight of the world on your shoulders, but at least it won’t actually give you bad posture. Start shopping for your Hollywood-worthy cubicles and desks on Arnolds.